When Rally-X failed to win over the crowds, Namco redesigned the game to address some of the complaints about the difficulty of the game that they had received. They made a number of adjustments, but the change that is the most immediately apparent, besides the slight face lift to the graphics, is the reduction in the number of enemy cars that you must avoid in the early stages. 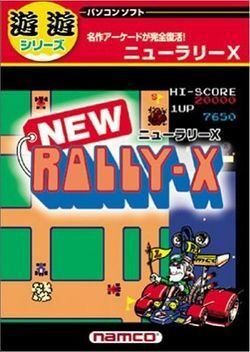 Namco named this improved version of the game New Rally-X, and as with the original, its score did not roll over at 1,000,000. It seems, however, that New Rally-X's arrival may have been too little and too late. While it went on to sell better than the original game, it did not seem to attract any attention from the home computer or console markets. This game would not be heard from again until 1995 when it was included in Namco Museum Vol. 1 for the PlayStation. However, at the turn of the century, two different versions of the game were released for Windows only in Japan. In 2006, the game was offered for download through Xbox Live Arcade, along with the usual set of twelve achievements worth a total of 200 . Joystick: Press the joystick to direct the car in the four cardinal directions that you would like the car to go. The car will never stop moving, and will automatically turn when it hits a wall. You can hold the joystick down in a new direction in anticipation of a turn. The car will even lean in to either side of the wall it brushes against to indicate that the turn will be performed. Smokescreen: Press the button to release three puffs of smoke behind your car. Enemy cars that run into this smoke will be stunned and unable to continue along the path that they were driving along. While this can be a life saver in close situations, using the smokescreen substantially reduces the amount of fuel you have. Using smokescreen more than once every thirty seconds will almost ensure that you will run out of gas before all ten flags are captured - and when this happens, your car will slow down and its smokescreen will cease. 1-2 Player Buttons: Push these buttons to begin a one or two player game. This is your car, the one that you must drive around the stage in order to collect every flag. Your car is not as fast as the red enemy cars, but it can turn corners faster. Your car also has one secret weapon against the enemy: smokescreen. But beware, using smokescreen burns fuel much faster than normal. If your car runs out of fuel, it will slow down to a point where escape from the enemy is impossible. As in the original, one collision with an enemy car or rock will destroy your car and you will lose one life. Enemy cars start out directly beneath your starting position. More get added as you reach higher levels, and eventually enemy cars are added to the stage at the very top of the map. They are faster than your car in a straightaway, and their drivers will attempt to collide by taking the quickest path that they can find. However, they're not as bright as you and they are easy to fool. They won't make a 180 degree turn unless they have absolutely no choice. Driving into your smokescreen, a rock, or another enemy car won't eliminate them from the game, but it will stun them for a second or two (indicated by their spinning around), giving you a chance to put some distance between you. One flag out of the ten is a special flag (indicated by the red "S" to its left side). By picking it up, the score that you receive for each flag thereafter doubles (i.e. whatever the old flag value is, it gets multiplied by two with a maximum of 2,000 points for the tenth flag). However, its effect will wear off if you die and have to finish the stage on your next life. The radar map will show this as a blinking dot, allowing you to grab it before the normal flags. Another flag will be the Lucky flag (indicated by the red "L" to its left side); upon collecting it you will receive the expected number of points for the flag, and a bonus for the amount of fuel that you have remaining. Your fuel gauge will then continue from where it left off. Since it shows up on radar as a normal flag, it's truly a "lucky" find. Simply put, rocks are a danger to your car. If you run into one, it will cost you one life. But if the enemy cars run into one, they will merely become stunned just as they do when they run into your smokescreen or each other. Their positions are also not indicated on the radar on the right side of the monitor, so you need to be careful. The graphics for the cars have been slightly improved, although their wheels are still not animated because of the game's age. The game has new background music (as with the original, it is by Toshio Kai), which many players have found quite enjoyable. The round layouts have changed colour and been simplified in order to reduce dead ends that players could become trapped in. Challenging Stages (Round 3, and every fourth round thereafter) — 7 cars. As mentioned in the section on the Flags above, the addition of the "Lucky Flag". The position of the Special Flag is now indicated on the radar by the flashing dot. By default, you now get an extra life at 80,000 points in addition to 20,000 points. 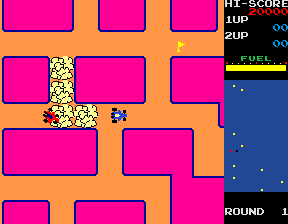 The number of rocks and enemy cars is shown before each challenging stage. There are 12 achievements for this game on the Xbox 360 worth a total of 200 . This page was last edited on 16 June 2017, at 19:50.